More than eighty people turned out on Saturday 21 April to vote on their favourite new design for the popular play area at Savernake Park, Westlands, Chelmsford - and work is now about to start on bringing their chosen play adventure to life. Created by leading playground supplier Kompan, the winning design is a children's paradise of excitement and movement. Catering for over fifty 2-12-year-olds at once, it offers 40 different items of play equipment to delight visitors. With springers, interactive panels, multiplay units for toddlers and children, a cradle swing, zipline and a hexagonal climbing frame, it's sure to keep kids happy and busy until hometime. The design also retains the much-loved seesaw that was already in place, while plenty of seating and picnic benches mean the whole family can relax together. Eager children won't have long to wait for their new adventure, with work due to start in mid-May. Councillor Bob Massey, Cabinet Member for Parks, said, "Play is the most important thing a child does - it's how we explore the world and learn how to be part of it, both on our own and with others. 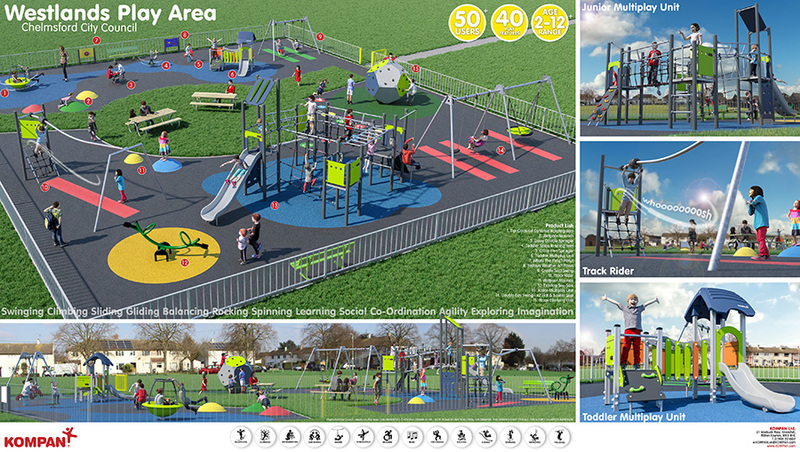 We want to provide the best possible parks for Chelmsford's children to make memories in, and with the help of the eighty residents who came out to vote, I am confident that the new play area in Westlands will be the perfect place for local kids to get active and have fun." Westlands is not the only play area to be getting a big revamp this year. Visitors to the city's Central Park, whose play area entertains tens of thousands of children every year, will be thrilled to hear that they will soon be able to vote on designs for a complete refurbishment of the playground. If you would like to be part of the decision, please come along to 'Celebrate Your Chelmsford's Parks' in the garden outside Cake on the Lake on Friday 27 July, 10am-2.30pm. As well as the play area consultation, there will be activities galore for children and staff on hand to talk to grown-ups about local parks, recycling and culture in the city. To be the first to hear more, follow http://@ChelmsCouncil on Facebook or Twitter.